Anyone who is involved in the recruitment and hiring process should consider their current strategy and what changes can help them stand out to gain the interest of top candidates. The days when companies just posted a basic job opening and had time on their side to hire has changed a lot. If you are looking to win candidates over, stepping up your game to attract great people is worth reviewing! The applicant pool is shrinking and unemployment is so low that those looking are getting several offers and they are selecting which company appeals to their values. Simple changes to your process can be the defining reason the prospective employee chooses your organization over others. Read these tips below to determine what changes you should implement. Make sure you are setting your company up for success. A great first impression happens when you show what your company is about and what you can offer. Conducting on-site interviews with various people provides a great candidate interview experience. Set aside time where several introductions with various leaders of your organization can happen. Candidates want to know what life is like working inside your company. Explain your company culture during the interview, give them a tour of the environment, and allow time for engagement with leaders and other employees. This provides the candidate a better sense of those they will be working with. It is important they get a chance to learn from managers and current employees why they should choose to work there. If it is a positive interview experience, they will walk away knowing you invested your time to provide a welcome and comfortable experience. Additionally, they may refer people because they like your company. A job description, if written well, provides a good starting point to set expectations. In the interview, explain the points not on paper to engage and excite them about the job. The role itself is a strong determining factor if the candidate sees that it hits the points they are looking for. Candidates want to understand if they will be a fit with the team and what the company’s mission and values stand for. By communicating and highlighting participation in community events, fundraising efforts, and volunteer projects the company promotes, this information provides value. Salary, benefits, and career growth is also what the candidate wants to understand. Candidates want this information before an offer is made. These topics should be made easy to understand and are an important part of the interview discussion! Show them what you can offer in a condensed time frame. Stretching your interview process out over 3-5 weeks is too long because candidates lose interest or accept other offers. Make the interview steps simple: ask the right questions, condense the interview steps to 2 -3 meetings, collaborate with your team on the timeline, and make decisions and offers quickly. Communicate with hiring managers that prolonging interview steps means you risk losing candidates. If the candidate before you is a culture fit and a close skill match, then act swiftly! After the interview, candidates want follow up and feedback promptly. If a candidate does not hear from you, interest diminishes and they are less likely to be as engaged two or three weeks later. Candidates still want to understand why they may not get an offer. Provide suggestions on what they did well and areas for opportunity. This kind of feedback gives them a chance to reflect and understand what to change. They view the interview as a learning experience and it shows your company cares enough to help them move toward success and professional growth! If your normal practice is to conduct 8-10 candidate interviews, then consider partnering with us to help you fill your positions. We provide recruiting screening, interviewing, and referral services at no cost. Since our services are on contingency, my time is free to you! Angie Smathers began her career in 1998 in the staffing industry. During her time with Celebrity Staff, she has established long-term partnerships with companies of various industries that include medical offices, revenue cycle management, HR, legal, advertising agencies, call center, banking, and financial investment firms. Angie has placed countless individuals who are starting out in their career path or assisted them in their career transition. She has successfully forged positive, lasting career paths by identifying high-caliber candidates with top employers. 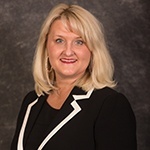 She is a member of the Lincoln Human Resources Management Association (LHRMA) and the Lincoln Chamber of Commerce. In 2013, Angie attained C&A Industries’ company honor of achieving President’s Club for a fourth time. In her free time, Angie enjoys spending time with family, walking, traveling, and reading.